James + James, a handmade furniture company based in northwest Arkansas, was born out of simple necessity: "We needed money and jobs," said co-founder James Eldridge. In 2011, while unemployed, James Smith tried his hand at carpentry. He spent $40 on materials and built a coffee table in his garage. He then listed it for sale on Craigslist and watched as orders for other pieces of furniture came pouring in. Eldridge reached out to his old college friend after seeing a photo of the table on Twitter. They launched James + James in January 2012 in Springdale, Ark. "Northwest Arkansas is a great place for young people who have have crazy ideas," said Eldridge. "There's lot of startup capital available, and business costs here are low." 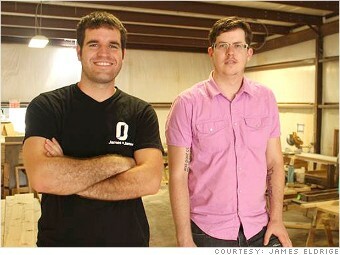 The company has grown far beyond the two James's: It now employs 22 people and has already crossed $1 million in sales.